Hacking for Dummies 3rd Edition Ebook Free Download. | Kanishk's Technical Blog. Hacking for Dummies 3rd Edition Ebook Free Download. Today,I'll Give you a New Ebook called "Hacking for Dummies 3rd Edition". This is a Good Ebook. In this You'll find very useful information which is needed for Hacking Purposes. 1. Use the Latest Ethical Hacking method and tools. 2. Test Your Windows or Linux Operating Systems. 3. Hack Databases,VoIP Systems and Web Applications. 4. Report Vulnerabilities and improve Information Security. 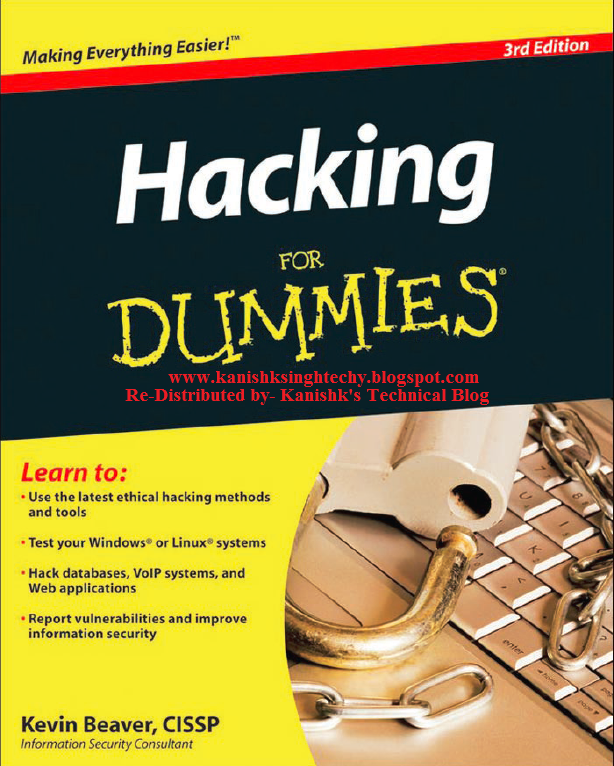 You Can Find the Download Link to Hacking for Dummies 3rd Edition Ebook at the end of this Post. Given Below is the Table of Contents of Hacking for Dummies 3rd Edition. Part I : Building the Foundation for Ethical Hacking. 1. Introduction to Ethical Hacking. 2. Cracking and Hacker Mindset. 3. Developing Your Ethical Hacking Plan. Part II : Putting Ethical Hacking in Motion. Part III : Hacking the Network. Part IV : Hacking Operating Systems. Part V : Hacking Applications. 13. Communication and Messaging System. 14. Web Sites and Applications. 15. Databases and Storage Systems. Part VI : Ethical Hacking Aftermath. Part VII : The Part of Tens. 19. Ten Tips for Getting Upper Management Buy-In. 20. Ten Reasons Hacking Is the Only Effective Way to Test. Appendix : Tools and Resources. To Download Hacking for Dummies 3rd Edition Ebook Click Here.